8 days of music and fun and two very black eyes where two hippies dropped an 18ft scaffold pole on the third eye...drongoed from day one . My regards and best wishes, how I wish I was with you all at stonehenge to celebrate the solstice and the gig at Glastonbury with my two old bands but alas working and far far away however I send you a picture of the stonehenge stage 1981 where the likes of not only Inner City Unit and Here OM Now entertained the solstice pilgrims but also Misty in Roots, The Thompson Twins and Ruts DC on a stage hosted by the polytantric circle. Solstice celebrations provided for free to facilitate the enjoyment of the solstice celebrations in difficult circumstances. It was 20 years ago today, Sgt Pepper on looking back to the future of more innocent days. Subject: Re: white auras and Japanese tourists??? 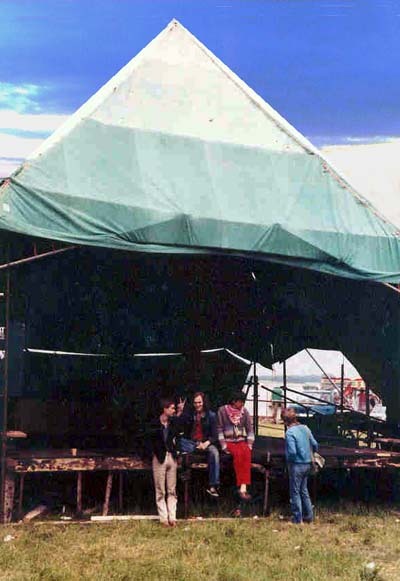 Stonehenge free festival was banned in 1985 and yes their were sound systems primarily reggae eg Coxsone and some hip hop PAs with the likes of Keith Leblanc of grandmaster flash and the furious five. At its height 83/84 stonehenge free festival attracted 60,000-80,000 people with bands and DJ�s playing for six days and nights. The crackdown by the authorities in 1985-1986 gave birth to the big raves with the likes of the mutoid waste company and the remenants of the convoy organising huge squat parties in London and the famous outdoor rave at Castle Morton which unfortunately led to rectionary criminal justice bill The year before Stonehenge freaks organised the first ever nights of ecstacy parties with the likes of the Shamen, The James Taylor quartet, Psychic TV,Dave Ball of Soft Cell, Gaye bikers on Acid, Nik Turner, an early formation of Portishead and Nasty suicide of Hanoi rocks, to name a few. The music was a mix of 60�s psychedelia, 80�s industrial and Chicago house which gave birth to the whole acid house movement. Seminal cuts were things like Steinski and Mass media, We�ll be right back,Jack the Tab, Superman and Mr fingers, Can you feel it. The idea was to generate the same kind of head space as the free festivals combining distinct enviroments musically and artistically mixing, music, lazers lights, spaces, sculptures, painting, fashion dance and culture into a heady mix where the audience would be transported to a euforical state of utopian frenzy. These parties were at the vanguard and therefore exclusive and sporadic because of the intensive and improvisational nature of the events. Highly praised but irrepeatable and unimitateable It is true to say they set the stamp of quality by which all subsequent raves were judged and inspired to emulate. Peter the rodie sorry doesn�t ring a bell. Perhaps you can send me a copy of your article? I got your adress by dice-george. Two questions for a artcile about underground-techno etc. Oh, a third question - Do you know Pete the Roadie? Any email-adress of him?
] which i guess bits may well be.